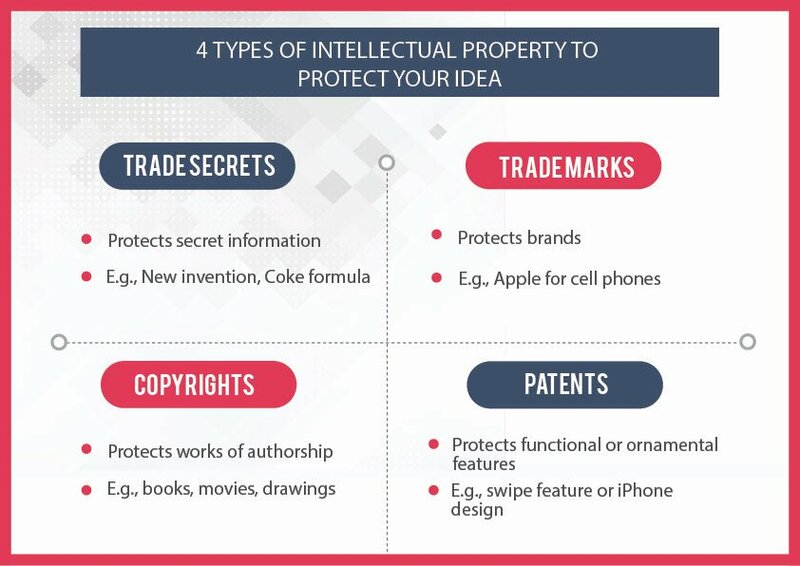 To protect your idea so that someone else cannot steal your idea, you need to secure one or more of the four different types of intellectual property (IP). Every invention generally starts out as an inventor’s trade secret. Before inventors market their inventions, they need to secure one or more of the other forms of intellectual property protection – patents, trademarks and/or copyrights. 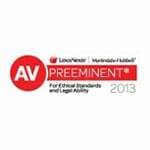 What does each type of intellectual property right protect? How to identify your trade secret? When to protect your idea as a trade secret rather than securing a patent? How to determine which type of patent is better for your invention? The first type of intellectual property right is a trade secret. All inventions generally start out as a trade secret of the inventor. Inventors have an instinctual desire to keep their ideas secret. To market your invention, you should protect your idea with one or more of the other types of intellectual property rights: patents, trademarks, and copyrights. To protect your idea effectively when you launch your product, you need to utilize one or more of the other three types of intellectual property before you commence your marketing activities. 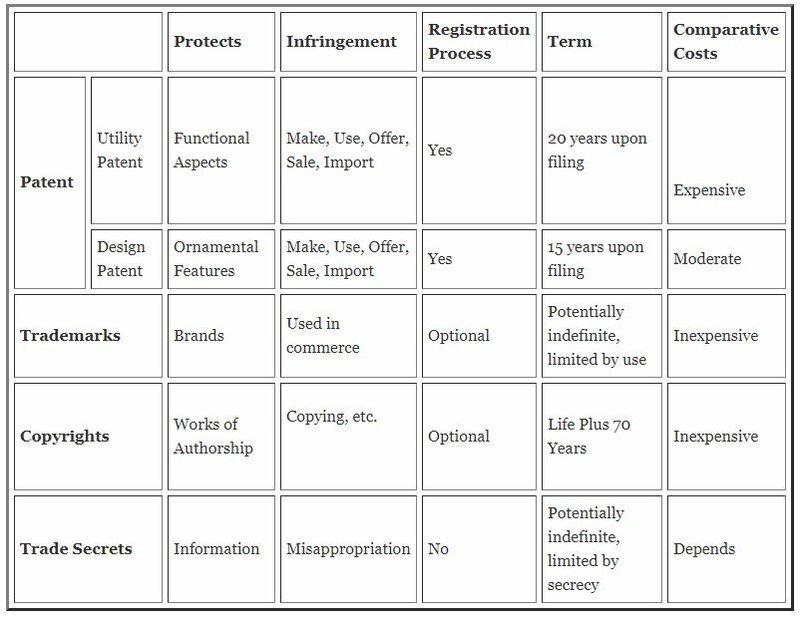 The table below illustrates each of the four different types of intellectual properties and what they might be used to protect in a broader sense. 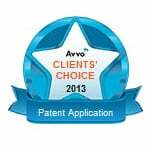 You must select the most suitable form of patent protection to effectively protect your idea or device. The information below highlights how you might determine which one of these intellectual property rights might be best for you to use to protect your invention. The discussion will also highlight and provide further clarification on some of the more significant information provided in the table. Most people do not know or have not really realized that they are able to protect their invention using multiple types of IP rights. However, most products can be protected by all four types of intellectual property rights. Take, for example, a can of Coca-Cola®. The brand, “Coca-Cola,” is a trademark. The formula for the actual soda is a trade secret, while copyright protects the packaging art. 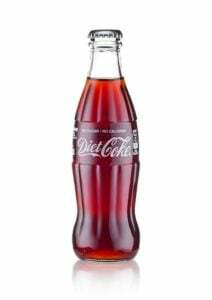 The shape of the Coca-Cola® bottle is protected by both (1) a design patent and (2) a trademark (i.e. trade dress). Likewise, your product can most likely be protected by one or more of the different types of intellectual property rights. 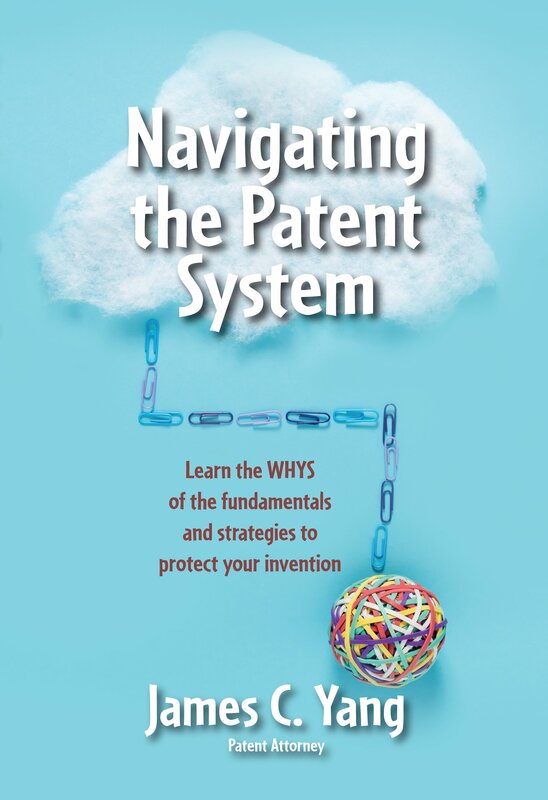 It is important to parse out which aspects of the invention or idea are suitable for patent protection, trademark protection, or copyright protection, and which aspects of the invention or idea should be protected by trade secrets. Be open-minded when you think through the types of intellectual property that might be applicable to protect your invention. To identify the trade secrets in your idea, you need to understand the definition of a trade secret. A “trade secret” is any valuable information that is not publicly known and of which the owner has taken “reasonable” steps to maintain secrecy. These include information, such as a business plans, customer lists, ideas related to your research and development cycle, etc. Trade secrets are not registered with a governmental body. All you need to do to establish your information as such is to treat it as a trade secret. Only those with a need to know should have access to your trade secret information. Disclosures should be done only under a nondisclosure agreement. When someone misappropriates your trade secret, you have to prove in a court of law that the information qualifies as your trade secret. You have to show that the information that was misappropriated was valuable because of its secrecy and you must show the steps you took to keep it secret. Put simply, the owner of the trade secret information must prove that the confidential information fits the definition of a trade secret given above. Trade secret protection lasts until the information is no longer valuable, the information is not secret, or the owner no longer takes reasonable steps to maintain its secrecy. Trade secret law specifically protects the misappropriation of trade secret information. This means that a wrongful or nefarious act must accompany the acquisition of the information. For example, if someone acting as an imposter steals trade secret information from its owner, the owner can sue the imposter for misappropriation of trade secrets. However, if the owner voluntarily gives trade secret information to an individual without limitation, there has been no misappropriation, and the owner cannot sue. It is also possible that the information may lose its status as a trade secret. This can occur if there has been a lack of reasonable effort to keep the information secret and/or the information is de facto no longer a secret. Most inventions start off as trade secrets which provides short-term protection prior to the marketing of your invention. Inventors are often initially cautious about revealing their inventions to others, even their patent attorney, and this is a good instinct to have. Trade secret protection is not appropriate for the long-term protection of any ideas which can be readily ascertained by reverse engineering or for inventions that can be independently created. If the information can be reverse engineered or independently created, then there is no nefarious act. If there is no nefarious act that accompanies the acquisition of the information, there is generally no misappropriation or wrongful appropriation of the trade secret information. Generally, trade secret protection is not optimal for mechanical or software products since both utilize a user interface that is available to the public and can therefore be reverse engineered. Trade secret protection may be optimal and sufficient for ideas and inventions that can be used secretly and therefore could be reverse engineered (e.g. recipes). Your brand needs to be protected because you do not want to invest time and money only to find out later on that you have to switch to a different trademark because someone else already using your trademark. In this instance, you would be infringing on that person’s trademark and will have to switch to a different trademark. Trademarks protect brands. The name of the product associated with the product or a service is called the trademark. A trademark is anything by which customers can identify a product or the source of a product, such as a name associated with the product. Typically, that would be the words that you use to refer to your product or service. When the brand or trademark is made up of words, we refer to this as a wordmark. Other things can serve as your trademark. For example, sounds, colors, smells, and anything else that can bring the product and/or its owner to the minds of a consumer can serve as your trademark. The most common types of trademarks are wordmarks, logos, and slogans. If the product configuration (e.g. a Coca-Cola® bottle) or packaging (e.g. Tiffany’s blue packaging) are nonfunctional and recall the product’s maker (i.e. source of the product) for consumers, the configuration can be protected and registered as a trademark. If you are starting out, protect the wordmark first. Then, you can seek trademark protection for the other forms of trademarks if you have the available funds to do so and if it makes sense in your overall marketing and business strategy. To properly protect your trademark, you should conduct a search to find out if others are using a similar mark to yours. If not, then file a trademark application to get your trademark registered. In the table, registration of a trademark was optional because you accrue trademark rights simply by using the mark in commerce. When you sell a product or perform a service under a brand, trademark law gives you common law trademark rights that you can assert against others in your small geographical region where you used the mark. Hence, to obtain trademark rights, you do not need to register your trademark but there are significant advantages for doing so such as nationwide rights and the right to block others from securing a registered trademark with the United States Patent and Trademark Office. Most products have a copyright. The images and words on the product packaging, the label, the product itself and the webpage can all be protected with a copyright. The advantages of a copyright registration are that it is inexpensive to secure, and the law allows you to demand attorney fees from infringers. Often times, your attorney fees are more costly than your damages due to someone copying your images and words without your authorization. Hence, being able to demand your attorney fees from the infringer is a significant leverage that can be used to force infringers to settle early on in the legal process. 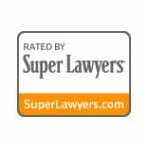 Without a copyright registration, you would have to pay your own attorney fees. Copyrights protect original works of authorship that are fixed in a “tangible medium of expression.” This means that the authored or creative work has been written down on a piece of paper, saved on an electronic storage device (e.g. hard drive or flash drive), or preserved in some other tangible format. Examples of copyrightable works include movies, videos, photos, books, diaries, articles, and software. Copyright does not protect ideas or useful items, which is the function of patents. Although software is a functional item, it can be protected by copyrights due to the creativity used in the selection, ordering, and arrangement of the various pieces of code in the software. You automatically have a copyrighted product in your creative expressions at the time that they are fixed in a tangible medium of expression. The copyright lasts for a very long time. For any work created on or after January 1, 1978, the term of copyright protection is the entirety of the author’s life plus seventy years after the author’s death. For works made for hire as well as anonymous and pseudonymous works, the duration of copyright is ninety-five years from publication or 120 years from creation, whichever is shorter. A copyright does not need to be registered, but registration does have significant advantages. You can file your own copyright application at www.copyright.gov. Importantly, if your copyright is registered, your attorney fees can be shifted to the infringer as discussed above, and you can ask the judge to award statutory damages. Statutory damages allow a court to impose liability on an infringer for up to 150,000 dollars even if the damages are significantly less than that amount. 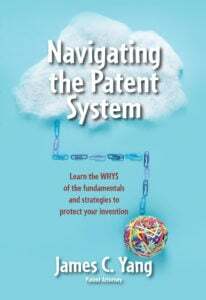 The following discussion will let you know how to identify which type of patent is optimal to protect your invention. Similar to the discussion above about securing multiple types of IP rights for your product or invention, you might be able to secure both a utility and design patent to protect your invention. If when you describe your invention to others, you describe the invention in terms of its function or utility, a utility patent application would be the best type of protection. If the invention is described in terms of its aesthetics, a design patent application would be the best type of protection. The design patent protects the ornamentation, sculpture, pattern design, layout, and other aesthetic features of a product. Sometimes, you will explain your product by using words that describe both function and aesthetics. In that case, you may be able to get both types of patents. However, if funds are limited, you may have to choose one of the two types of patents that is better suited for your invention. 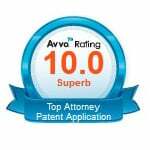 Seek competent patent counsel in this instance since a patent attorney would be best able to help you make the right decision. To get a utility patent, you need to apply for a patent with the USPTO. If you start to market your product without applying for the patent, then eventually (i.e., after one year) your idea will be dedicated to the public. The term for a utility patent is generally 20 years from the filing of your nonprovisional patent application and starts immediately when the patent office issues your patent. To get a design patent, you need to apply for a registration with the USPTO. If you start to market your product without applying for the registration, then eventually (i.e., after one year) your idea will be dedicated to the public. The term for a design patent is 15 years from the grant date of your design patent. Design patents are useful only in a few situations. This is because if the infringer changes the look of the product so that it does not look like what is shown in the design patent, then there is no design patent infringement. The following is a non-exhaustive list of situations where a design patent might be useful. Design patents are useful for blocking the sale of counterfeits, the importation of overrun (i.e. excess production), or rejected products that have been manufactured overseas for the inventor. These imports will be identical to the drawings in the design patent, and if imported into the United States, they may be blocked by Customs. If these products do enter into the United States, the importers, distributors, users, and manufacturers may be sued for infringement. Design patents are also useful for products sold in sets (e.g. furniture) because buyers must purchase products that look like the original product to maintain the complete sets. By obtaining a patent on these types of products, you can block others from selling products that look like your product covered in the design patent. Design patents may also be useful for large manufacturers. For example, Apple, Inc. obtained several design patents for various parts of the iPhone including the housing and the arrangement of the icons on the display. 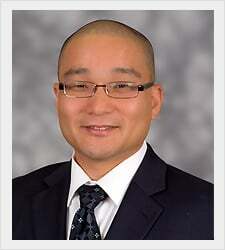 The author, James Yang, is a patent attorney in Orange County, California. Contact James to schedule a consultation and discuss your invention.